NADY PRA-8 8 CHANNEL MICROPHONE PREAMP WITH INDIVIDUAL CONTROLS FOR EACH CHANNEL PRICED AT WHOLESALE COST. Condition: BRAND NEW IN ORIGINAL PACKAGING. The Nady PRA-8 is a professional, multi-purpose 8-channel microphone preamplifier designed for the most exacting world class studio applications. Solves many of the connectivity problems arising in studio and live sound applications from using increasingly popular digital audio interfaces. This is a sing 1U rack space pre-amp and it is perfect for your microphones. This is perfect for live and studio applications. 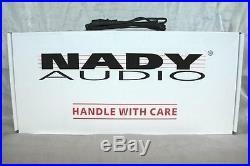 We know you need reliable equipment, and with a trusted brand who has been in the business for over 20 years, this Nady Microphone Preamp is your best option. Eight totally independent world-class preamps in one single rack (1U) package. 1/4 TS outputs for each preamp. Individual gain control on every channel. Peak LED indicator on each channel with up to 75dB of gain. Individual Phantom On/Off switches for Phantom Power. On LED indicators on each channel. Rugged construction for maximum long-term reliability. Highest quality components and advanced design. Ultralinear, high bandwidth operational amps for no-compromise crystal clear audio. Exceptionally low noise and low distortion. Shielded internal dual regulated power supply. 115V(60Hz)/230V(50Hz) select switch and fused IEC power cord connector. If your item is defective within the first 30 days of when it was delivered to you; you have the following options. We will send you a. To replace the item for a brand new one. If you want to return your item within the first 30 days of when it was delivered to you; you have the following options. This includes blown speakers with burned voice coils. The item "Nady PRA-8 8 Channel 1U Microphone Preamp Mic Pre-Amp" is in sale since Monday, November 24, 2014. This item is in the category "Musical Instruments & Gear\Pro Audio Equipment\Preamps & Channel Strips". The seller is "audiosavings" and is located in Inwood, New York. This item can be shipped to United States, Canada, United Kingdom, China, Mexico, Germany, Japan, Brazil, France, Australia, Russian federation, Denmark, Romania, Slovakia, Bulgaria, Czech republic, Finland, Hungary, Latvia, Lithuania, Malta, Estonia, Greece, Portugal, Cyprus, Slovenia, Sweden, South Korea, Indonesia, Taiwan, South africa, Thailand, Belgium, Hong Kong, Ireland, Netherlands, Poland, Spain, Italy, Austria, Israel, New Zealand, Philippines, Singapore, Switzerland, Norway, Saudi arabia, Ukraine, United arab emirates, Qatar, Kuwait, Bahrain, Croatia, Malaysia, Chile, Colombia, Costa rica, Dominican republic, Panama, Trinidad and tobago.